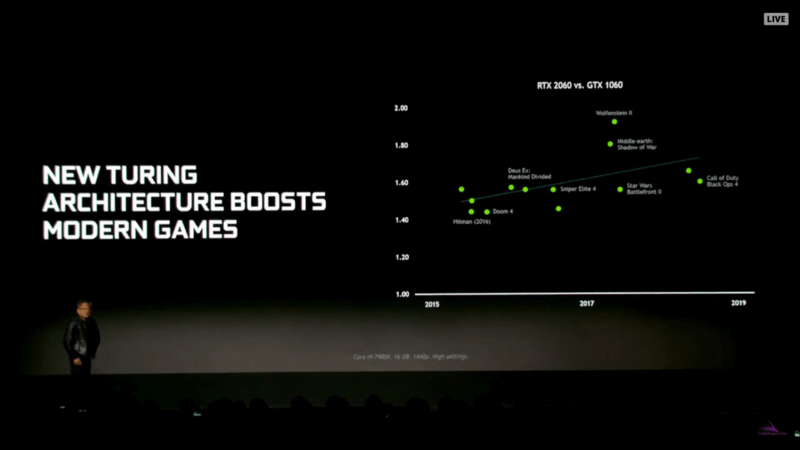 Nvidia has shared a graph comparing 2060 performance with 1060 performance, and despite the fact it’s about $100 more, the 2060 still trumps it in value. In Hitman and Doom it’s about 40% better, in Sniper Elite 4 and Battlefront II it’s about 50% better and it exceeds 60% for Black Ops 2 and Wolfenstein II. Bear in mind though, these games were cherry-picked by Nvidia. Nvidia was quite vague about the full specifications of the card, but we’ll update once they are revealed. For now, we know that it will feature 6GB of 14Gbps GDDR6 and 5 gigarays/sec of ray tracing performance. Nvidia’s claims that the 2060 can run Battlefield V at 60 fps with ray tracing do seem to be genuine, given that the RTX 2070 exceeds 70 fps on low settings with 6 gigarays/sec. The 2060 will launch on January 15th with a variety of board partners in addition to the standard Founder’s Edition variant. For the first time, system manufacturers will be releasing new systems featuring the card on day one. Nvidia claims that almost every computer manufacturer in the world will be selling systems with the 2060. 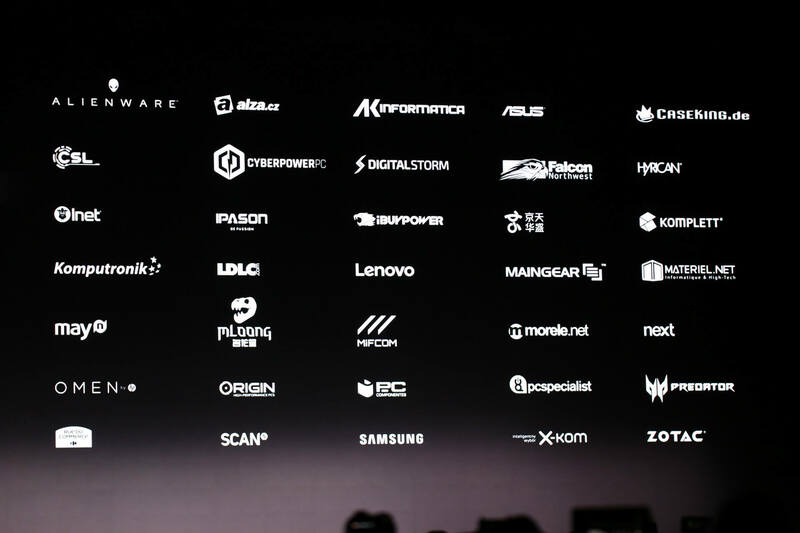 Jen-Hsun Huang, Nvidia’s CEO and founder, recognized how important the x60 part of their lineup was during his presentation. “Desktop gamers are demanding, and the RTX 2060 sets a new standard — an unbeatable price, extraordinary performance and real-time ray tracing that blurs the distinction between movies and games.” The GTX 1060 is currently Nvidia’s most popular GPU. As a bonus, Nvidia is also offering a free copy of Battlefield V or Anthem (which will also feature ray tracing support) with any new RTX 2060 or RTX 2070 purchases. The RTX 2080 and RTX 2080 Ti will come with free copies of both games. The 2060 certainly looks promising, but as usual, we’ll have to wait until we can benchmark and review one to see if it lives up to Nvidia’s bold claims. Let's hope that it really is that good and that the MSRP is not just a number on paper. 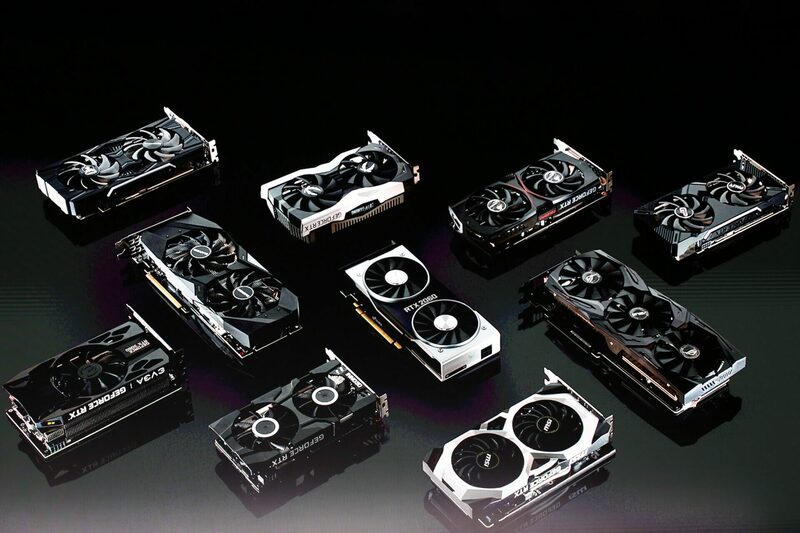 Given the 1060's die size is 200mm2, the 1070/1070 Ti/1080's die size is 314mm2 and the 2060's is said to be a whopping 445mm2, I think most gamers would better appreciate ditching the Ray Tracing stuff and selling a 314mm2 GTX 1160 (GTX 1070/Ti) with a sub $250-$300 price to match. Even if you're a fan of ray-tracing, there's no question they're pushing it 1-2 generations too early given game design isn't dictated by top-end, it's dictated by mainstream (xx50/xx60) cards (and consoles) and if they lack the horsepower then that's a whole lot of wasted die space for nothing. If nVidia are determined to use non-shader die space for something, personally I'd rather see boundaries pushed on, eg, real-time video encoding approaching broadcast quality (ie, a much better quality Shadowplay). Khanonate, D3z4R1, cliffordcooley and 3 others like this. 2070 with Ray Tracing @ 70fps (Low Settings). All good points, but you can't program for a technology that isn't there. It may be that these cards should be only sold to developers for a number of years to actually create their games with prior to the general public. Similar to the console experience. Agreed. Realistically only the V100, Titan, and 2080 Ti should have Tensor cores. It's wasted on anything else. I am really happy to see Nvidia dominating - and now about to take over the midrange GPU segment. All these fanboys talking about how fabulous AMD is for the "budget" consumer are now about to get hit with an undeniable competitor that outshines those AMD cards. But all of these claims are based around ray tracing and whether or not developers take advantage of it. If Ray Tracing isn't worth the extra development time, then none of the RTX line will be used to potential - although they may be marginally faster than the last gen 1000 line. Either way, I'm glad I bought the 2080Ti and I could see myself getting a 2060 or 2070 for my second desktop. And I'll really be happy to see the 2060 in laptops when I upgrade to a new laptop. You have not even heard Dr Su's Key Note speech yet. And how is $350 dominating, when for $50 more you can get a Vega64..? which competes with the 1080..? Are you daft..? The big thing to take out of this, is that you are no longer tied to your G-sync display. I bought my 2080 because my 980ti was on the fritz and needed another g-sync card. Sounds like you are real happy for Nvidia, but you do not sound real happy for enthusiasts. JaredTheDragon, Wessell Urdata and GreyFoxx like this. So is It overpriced mid-range or underwhelming high-end? ddferrari and mrtraver like this. Ray tracing tech is like panniers on my bicycle - getting in the way when I just want to hop on and ride, but somewhat useful once in a while..........probably. Let me see the benchmarks, first! So the founders version of this is coming in at £329 in the UK (confirmed by overclockers this morning), cheaper than most Vega 56 cards retail at over here. I must say I didn’t expect Nvidia to beat AMD on value with a product possessing tensor cores but this really is a better buy than a Vega 56 before you even add RTX features. Curious to see if Nvidia will release RTX on the budget end, like a 2050 or RTX free, like an 1150 to compete with the RX 590. Wessell Urdata and Evernessince like this. 1070 with Ray Tracing @ 70fps (Low Settings). Who benchmarks a "1070" with Raytracing ? GreyFoxx and hahahanoobs like this. Reserving judgement until the Judge, Steve The GPU Lord, officially heats up the silicone. And lets run this baby at 2K Max Settings/4K High settings, $350 ain't exactly $150 territory, that's still a pretty shiny penny. GreenNova343 and Evernessince like this. Since it doesn't have Juang rays, I d rather risk buying used 1070ti for under 300. You guys didn't get a review sample? Anandtech already has their review but it was missing the actual ray tracing performance which is ludicrous. Was hoping to see your review but I guess I'll hafta wait. 1060 6GB MSRP was $249. Good cards quickly soared to $300 in the latter half of 2016. I picked up my MSI 1060 6GB in March/April 2017 for $219 before they soared back up to $300 because I was lucky and diligent. $200 at launch never happened. +1 to this. I bought a GTX960 in 2015 for AU$270. The GTX1060 6GB was released at around AU$400 and only went up from there. I remember well because I was waiting for a price drop before upgrading. Heck, it's still around AU$400 right now. Offering the same performance at the same price as Nvidia's own card released 2 years prior isn't going to change the market. That's assuming we take Nvidia's claims at face value, which given recent events, you'd have to be extremely generous given how misleading they have been lately. "It just works!" rings a bell. It's also questionably not a midrange card at $350. At their current prices I'd call the 2060 and 2070 high end and the 2080 and 2080 Ti enthusiast. The midrange last generation was the 580 and 1060 6GB while the 1070 was in between high end and midrange. Given that $350 is the MSRP and Nvidia haven't sold at MSRP since they renamed "reference" to "founders edition", I'm going to bet it's going to land solidly in the high end category. I certainly don't see how this will affect anywhere near the budget category. This card doesn't come anywhere near it. I think your purchase of a $1,200 video card has skewed your perception of where the budget market lies, which is $120 (with some flex of course) and below. I don't know why you'd be happy about paying more for less. There's nothing happy about Nvidia continuing to increase the price of graphics cards. There's nothing happy about Nvidia continuing to increase the price of graphics cards. It seems like there are a substantial number of enthusiasts with similar thoughts. Perhaps nVidia is in line for a rude awakening - but they have made their bed.